The Green Roof Centre – Sheffield leads the way! In Britain, the midlands city of Sheffield is at the forefront of developments with green roofs. Planning rules for the city require all new buildings over 1000 square metres, or more than ten houses, to integrate 80% of vegetated cover. Policy and initiatives have been influenced by the Green Roof Centre, which is part of Sheffield University’s Landscape Architecture department. 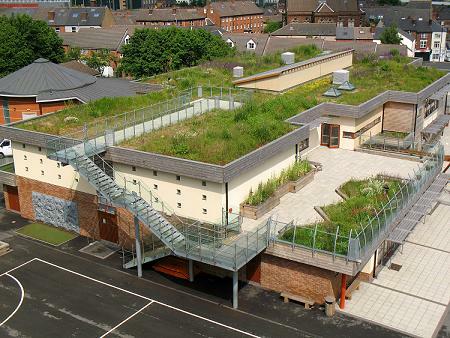 The Centre has been conducting green roof experiments for the past decade, including Sharrow school, (pictured) and several of the rooftops of the university’s new buildings, as well as on various other buildings across South Yorkshire. To date there are over a 120 green roof building projects in the one time steel city.